Is your inbox bursting with unread emails? Some of us have hundreds, even thousands. We stop noticing them, accepting that we’ll never clear the backlog. You might not think having a full inbox is sapping your productivity, but believe me, it is. Imagine your inbox is your desk. Would you want to sit down every morning at a desk covered in dirty coffee cups and thousands of unread memos? You’ll always feel like you’re one step behind. Not convinced yet? Let’s put it a different way. Picture each unread email as a stone. You pick it up and put it in your pocket to look at later. At first, the load isn’t too great, but before long your pocket is full. It’s heavy, weighing you down with every step. The stones, start falling out of your pockets as you walk, without you even noticing. Most were probably worthless, but some might have been gems. You’ll never know. Letting your inbox get out of control means you’ll never know what opportunities you’ve missed. But it doesn’t have to be this way. There’s always time to break the habit. Invest some time now and your productivity will soar. A good chunk of your inbox will be taken up with emails that are either spam or no longer useful. Unsubscribe from things that are irrelevant. If you’re worried you’ll miss out on special offers from companies, then use a service like unroll.me. It cleverly hides all your subscriptions and sends you a daily email letting you know what you’ve received so that you can still access them if need be. You even get to choose what time it arrives each day. I guarantee you’ll feel more in control when you’re not drowning in offers and discount codes. Allocate a set amount of time to spend sorting out your emails. Sit down and do it. Respond to things, but also spend some time tidying up. Set up a separate folder in your emails called ‘to action’. Move emails that you need to respond to into this folder. It’s always important to acknowledge these emails. Send a quick reply right away, letting them know you’ve received their message and will be in touch with your thoughts soon. It’s reassuring and professional. We all know how annoying it is when our own emails are ignored. Don’t be that person. If you never delete or archive your old emails, it’s like having the same to-do list for eternity. Not a happy thought! Keep only ‘to deal with’ emails in your main inbox and have other folders for everything else. Keep things organised by using labels, folders or categories. This is a great way of quickly and easily finding an email on a specific subject. Have a separate folder for each client or project. You’ll never lose an email again. Don’t have emails sitting in your inbox that you’re not going to action or do anything with. If you can’t bring yourself to delete them completely – move them to a separate archive folder. You can start a new one every year, making it easy to search for old emails. Your inbox should now be looking a lot tidier. But how do you keep on top of things? You don’t need to reply to every single email straight away. However, if it takes less than a minute to reply then try to do it quickly and tick it off the list. If it needs more thought, save it for when you have that time to focus. Remember to move it into your ‘to action’ folder and to send an acknowledgement, particularly if you know you won’t get time to action it on the same day. If you send similar responses on a regular basis, set up some templates. There are different methods for Outlook and Gmail but this will save you a lot of time – even if you need to tweak it slightly each time. Need more advice? 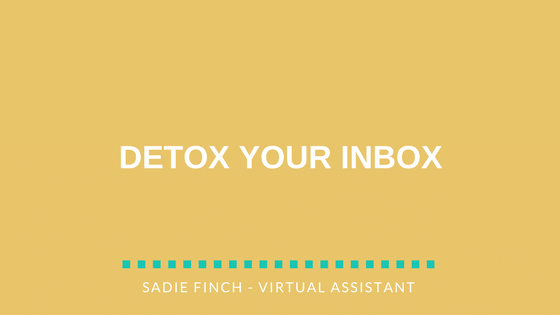 My inbox detox service will cover all of the above – I’ll work with you to find out your priorities and your working style and get your inbox detoxed in no time! Why not see if you can achieve Inbox Zero…? Go on, I dare you.